Doesn’t that just look like summer on a platter? I love fresh sweet corn. Sweet corn that I buy out of the back of a truck along side the road or at the farmers market. Sweet corn that I know was grown near my city. It has the BEST flavor. This is one reason why I love summer in the Midwest. There always seems to be an abundance of fresh and oh so sweet sweet corn. The only down side is that sweet corn season is so short. I planted sweet corn this Spring in hopes that I would be able to walk out the door and pick my own. I’m not sure if I am going to be able to pick any this year. We had such a weird Spring so I am going to blame my sweet corn failure on that. Instead of walking out my door I had to drive to the farmers market (bummer). The beans I did grow myself. They went from garden to boiling pot of water to my belly in just a matter of minutes. Utter perfection! 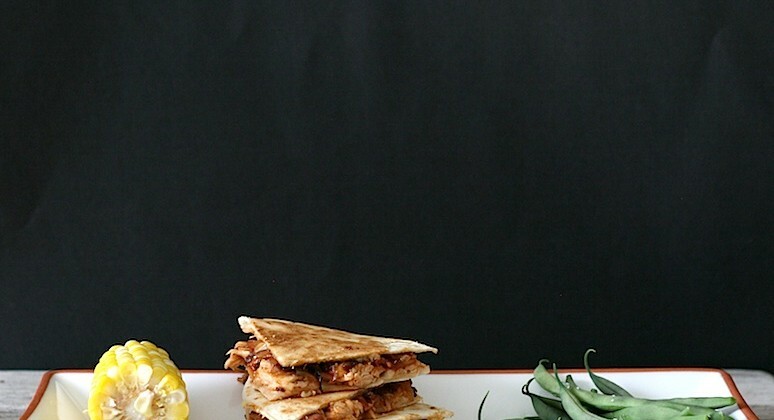 These chicken bacon quesadillas are so gouda! See what I did there? I packed them will grilled chicken tossed in Sweet Baby Ray’s barbecue sauce (a total fav), crispy bacon, caramelized onions, and you guessed it gouda cheese. Mmm. Mmm. Mmmm! Â A great substitute for the grilled chicken would be RotisserieÂ chicken. Pick one up on your way home from work (and skip theÂ caramelizedÂ onions) and you could be eating in a matter of minutes. Cook chicken for about 3-5 minutes per side or until juices run clear. Set aside. Slice chicken into thin strips, toss with barbecue sauce. Chop bacon into bite size pieces. Lay 1 four tortilla on cutting board. Place a few slices of thinly sliced gouda on the tortilla. Sprinkle with 1/4 of the chicken, bacon, and onions. Top with more thinly sliced gouda. Place second tortilla on top. Cook in a cast iron skillet or nonstick pan over medium heat for just a couple minutes per side. Flip and cook the other side for just a couple minutes. You want the cheese melted and the tortilla to get slightly brown and crispy. Looking good, look at those yummy beans! Corn this year isn’t going well for too many people, I’m reading really sad articles about farmers and their corn this summer. Our corn was looking “eh” so we just yanked them out last week to make room for something that will actually grow. Bummed about the corn! I think I might pull out my corn too. It just makes me so sad. 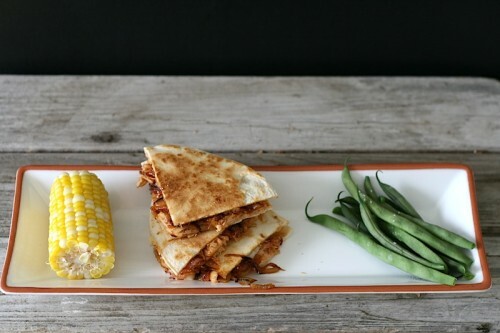 Ugh, quesadillas are my world in summertime. I’m in the middle of winter in the southern hemisphere right now, but these sound wonderful. Quesadillas are such a quickly dinner and I love not having to heat up the house just to eat! Yes it does look like summer on a plate!! I love fresh sweet corn especially on day one of being picked. These quesadillas look amazing!! Jumbo meatballs, stuffed with mini mozzarella bites. This family favorite gets a JUMBO update and everyone is happy with the results. Chipotle Black Bean Chicken Tacos are full of smoky flavor. Made in the slow cooker these tacos are the perfect dinner to come home to. Cod Piccata may sound fancy but this dish is a simple, healthy, and quick dinner to whip up to impress friends.